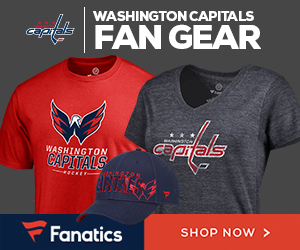 When I signed on for Capitals Outsider, I was aware of their ridiculous affinity for Bobbleheads. Since I was going to be covering the minor leagues, I thought I was safe. Then Hershey released possibly the most confusingly marketed bobblehead in recent years for *any* of the franchises – the Keith Aucoin Ford Bobblehead. It doesn’t sound confusing, right? 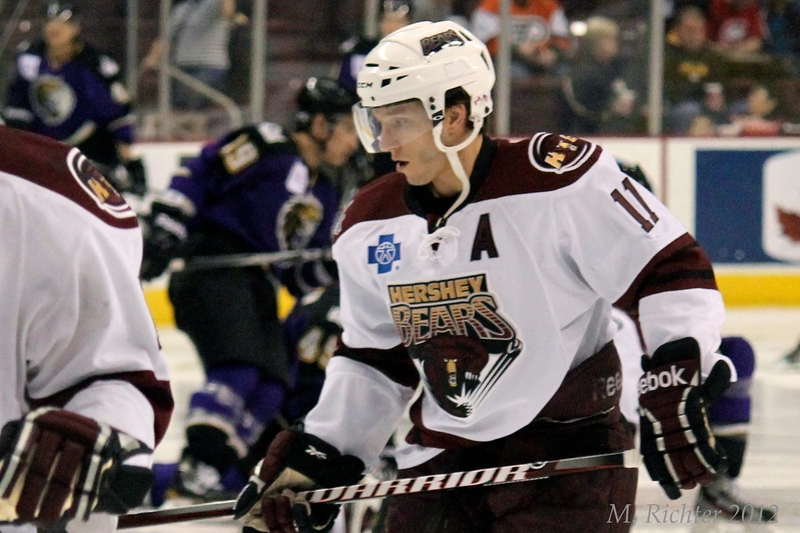 After all, Keith Aucoin is one of the BIG NAMES in Hershey – league leading scorer, AHL All Star, power-play lynch-pin (I could go on, but you get the idea). Here’s the catch – the giveaway tonight was listed on all of the promotional schedules as “Ford Bobblehead Night.” Up until February 2, forward Matt Ford was an important piece of the Hershey lineup. Then he was shipped out to the Adirondack Phantoms in exchange for defenseman Kevin Marshall (the two recently met again; it wasn’t pretty). You understand the confusion. 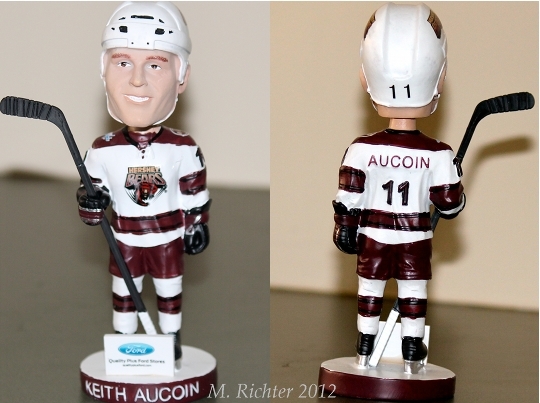 If one hovers over the text, it helpfully explains that it’s a Keith Aucoin bobblehead. Let’s just say that not all of us thought to pursue further clarification. With Aucoin in Washington through the end of the season, expect to see a few of these babies up on eBay in the near future. Update: The bidding wars have started. First Buy-it-Now Price? $60. The real Keith Aucoin, earlier this season when he was wearing the Chocolate & White regularly.